Join us for our Fall Kick-Off Event! 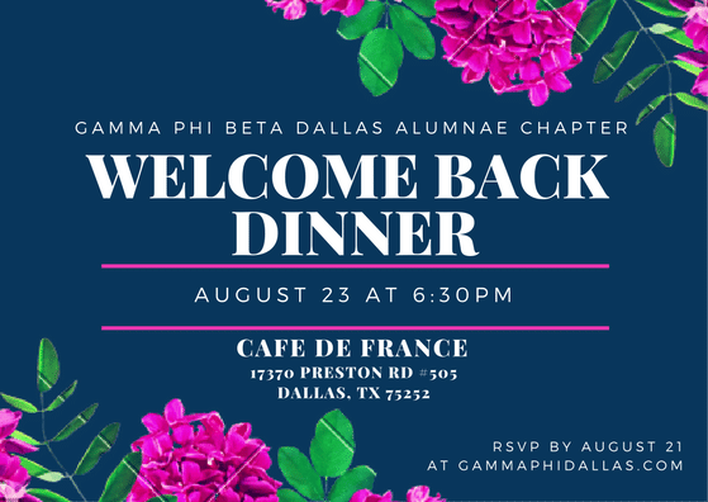 Come enjoy a delicious three-course dinner at the lovely Cafe de France and an evening of catching up with your sisters new and returning. You won't want to miss out on this event, as you'll find out about all the new and exciting activities we have lined up this year! We will also take time to discuss updates from 2016 Gamma Phi Beta June Convention in Atlanta, Georgia. The cost is $30 for the three-course dinner with a restaurant cash bar. As with all events, our RSVP deadline is two days prior to the event. We kindly ask attendees also make payment by the RSVP deadline of August 21; however, we will also be accepting payment at the restaurant. RSVP: Please RSVP & make your payment below by Sunday, August 21st. Please RSVP and make payment below by Sunday, August 21st. Make your payment for Welcome Back Dinner!